(NewsUSA) - It's that time of year again--the time when families and friends come together to celebrate with food and open arms. That's right, it's almost playoff season, with football, basketball, and hockey playoffs all just around the corner. 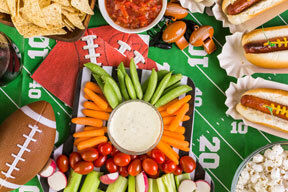 With these highly anticipated games come the equally anticipated snacks--from chips and dip to wings and hot sauce. In fact, a lot can be said from people's usage of dips and sauces, and that usage has increased over the past year. According to a survey by the Association for Dressings & Sauces, the reasons for using dips and sauces more often include: making more or new foods that need them, using them on more foods or as a healthy option with healthy foods, and cooking or eating at home more. So satisfy your craving for the perfect mid-game snack and bring them to parties in new and creative ways. *	Survey results show that Asian sauces, horseradish, hot and Mexican sauces are more popular than they were last year, with hot sauce and mustard being used several times a week by the majority of respondents. So go exotic and use bold flavors in your dishes! *	Geography also has something to say about what you should bring to a gathering. People in the Northeast reported a greater affinity for horseradish. Folks in the Midwest loves barbecue sauces. Asian sauces and hummus are more popular in the West and the South is all about hot sauce. These tips should get your creative juices flowing so you can bring a tasty and unique contribution to whatever playoff party you're attending. Should you need a little recipe inspiration, however, check out some dishes at www.dressings-sauces.org/recipes.